Inscriptions: u.r. handwritten in ink: "print 13 + 14 together / 13"; c. handwritten in ink: "enlarge to fit end to end"; l.c. handwritten in ink: enlarge to fit"; b.c. 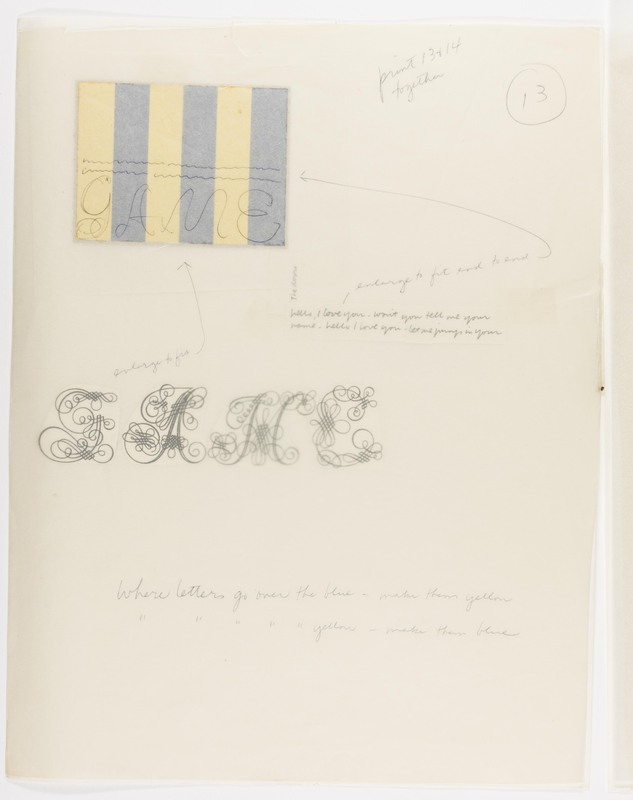 handwritten in ink: "where letters go over the blue - make them yellow / " " " " " [sic] yellow -make them blue"; verso, u.r. handwritten in pencil: "13 +14"
"Untitled." Corita Kent in the Grunwald Center Collection. Los Angeles: Hammer Museum, 2017. https://​hammer.ucla.edu/​collections/​grunwald-center-collection/​corita-kent/​art/​untitled-preparatory-material-for-g-is-for-game/​.